Filing closed today in Michigan, and all House incumbents running received partisan competition. This means that we know the partisan composition of 30 (26 GOP held and 4 Democratic held) House seats. We also know that because filing has closed in 31 states, the Congressional field has largely been set in 317 out of 435 House races and in 20 out of 36 Senate races. Of the House seats with filing deadlines still open, 85 are held by Democrats and 33 are held by Republicans. 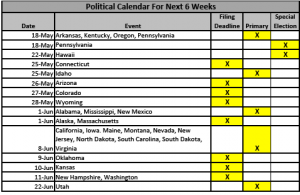 After Michigan’s filing deadline passes, four more states see their Congressional filing close in rapid succession this month: Connecticut (May 25), Arizona (May 26), Colorado (May 27), and Wyoming (May 28). So by the end of May, we will know who the candidates are in 338 House races (out of 435) and 20 Senate races (out of 36). Last week, 41 year Congressional incumbent David Obey (D-Wisconsin) decided to retire. Rep Obey was an old fashioned progressive Democrat who chaired the House Appropriations Committee and, accordingly, was the architect of the Obama stimulus plan. He was facing serious Republican opposition this year from Ashland County DA Sean Duffy, who also appeared in MTV’s “The Real World.” Interestingly, the last serious Republican challenge Rep. Obey had was in the 1994 GOP landslide, when he was held to 54% of the vote. We are still keeping an eye on the possible retirement of 2006 freshman Michael Arcuri (D-New York), but we may not know anything definitive until July 15, which is the filing deadline for New York. Back in March, we had compared the 2010 electoral landscape to that of the 1994 GOP landslide, since political pundits attributed the electoral sea change solely to the volume of retirements. We looked at the 1994 results and discovered that in 1994, 51 House members (30 Democrats and 21 Republicans) and nine Senators (6 Democrats and 3 Republicans) had retired. 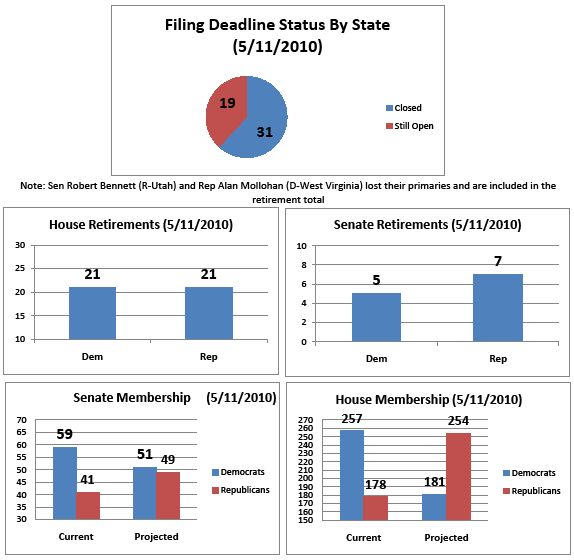 So far this year, the retirement count is 42 House members (21 Republicans and 21 Democrats) and 12 Senators (7 Republicans and 5 Democrats). 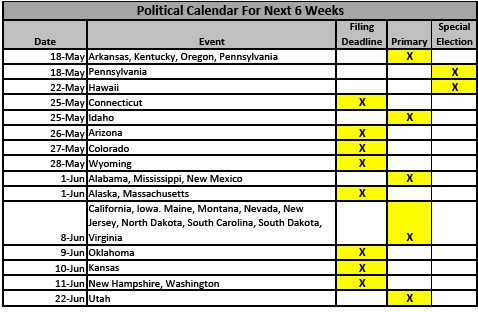 This count may still change over the next few months, as (1) Congressional filing is still open in 118 House races and 16 Senate races, and (2) 43 states have yet to hold their primaries, and we see several potentially vulnerable incumbents who may be prematurely “retired” by those who vote in party primaries. This past weekend, the voting records of two Congressional incumbents in Utah created voter backlash from party activists. 18 year incumbent Senator Robert Bennett (R-Utah) became the first incumbent of the 2010 election cycle to be defeated, as he failed to get sufficient delegate support to make it onto the GOP primary ballot. 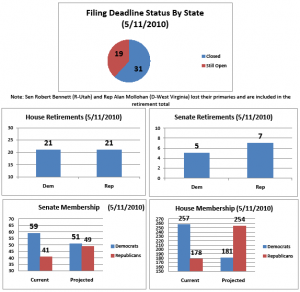 He got into political trouble for his support of TARP and of individual health insurance mandates, and was consequently the target of the Club for Growth – in fact, it was estimated that 70% of the delegates who kept Senator Bennett off the primary ballot were new delegates. Though Utah law prevents him from running as an Independent like Charlie Crist did in Florida, he may still run on a write in campaign, and he has not ruled that option out. Meanwhile, on the Democratic side of the aisle, the state’s lone Democrat (10 year Congressional incumbent Jim Matheson) faced party activists upset over his opposition to healthcare reform and was forced into a June 22 primary when an opponent received 45% of the delegate vote. Meanwhile, over in Nebraska, incumbent Republicans (its Governor and three Congressmen) are winning their primaries comfortably, with one exception: GOP incumbent Lee Terry (R-Omaha), whose 2008 re-election campaign curiously involved his asking Independent voters supporting Obama to split their tickets and vote for “Obama-Terry”, faced Tea Party opposition, and was re-nominated with only 63% of the GOP primary vote. Georgia held an all party primary tonight to replace 18 year incumbent Nathan Deal, who resigned in March to run for Governor. Five candidates (four Republicans and a Democrat) signed up to run in this 75% McCain district in northern Georgia. Not only will the June 8 runoff feature two Republicans, but the lone Democratic candidate ran a weak 5th with 6% of the vote. Later this week, we will discuss upcoming primaries in Arkansas, Kentucky, Oregon, and Pennsylvania on May 18. There are also Congressional special elections in Pennsylvania (May 18) and Hawaii (May 22). Republicans have a legitimate chance of capturing both seats; in fact, in Hawaii, intenal squabbling between the Hawaii Democratic establishment and the Washington D.C. Democratic political establishment was never resolved, and the Democratic Congressional Campaign Committee has decided to pull out of the special election race. Two weeks ago, we had projected a 75 seat GOP gain in the House. The Obey (D-Wisconsin) retirement had already been included in this number as a likely Republican pickup. The seat of Alan Mollohan (D-West Virginia), however, was previously classified as safe. Despite the fact that (1) he voted with the Democratic leadership on the stimulus and on every healthcare reform vote, and (2) McCain carried the district with 57%, he has not faced a significant electoral challenge since 1984. However, his primary defeat means we see this as a likely GOP pickup, and we are therefore revising our estimate to that of a 76 seat GOP gain. John is a political consultant and blogger with JMC Enterprises with expertise in poll sample development and analysis, development of targeted voter files for phone canvassing or mail outs, campaign strategy and demographic consulting, among other things. See his site at WinWithJMC.com for more information.